Pigsticks and Harold are travelling through time - will they ever make it back to Tuptown? 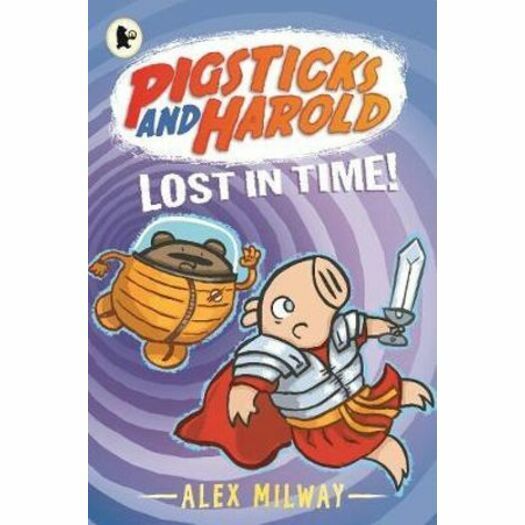 Pigsticks and Harold travel through time in the fourth book of Alex Milway's hilarious, colour-illustrated series. When Pigsticks wants to win first prize at the Tuptown Science Fair, there's only one place to look for help - the future! But his rusty time machine is hard to control and soon Pigsticks and Harold are landing in trouble all throughout history. Will they make it home, or be lost in time ... for ever? The fourth book in a hilarious series about the adventures of Pigsticks, an over-optimistic pig, and his sidekick Harold, a nervous hamster. Readers will enjoy recognizing funny twists on famous historical events and people, from the dinosaurs to the Vikings. Perfect for boys and girls who love funny books. Alex Milway has always enjoyed making up stories and, after leaving art college, he discovered that he liked to write and illustrate them as well. His interest in furry creatures first reared its head in the The Mousehunter trilogy, where weird and wonderful mice ran riot all over the world. In The Mythical 9th Division, the fur quota got even bigger, as he had to master the art of drawing a troop of yetis whose main purpose was to save the world. His Pigsticks and Harold series features a furry hamster and a decidedly un-furry pig. Alex is now a full-time author-illustrator and works from his home in London, SE20.